It used to be you had to get an email capture page set up from one company, and have your email marketing sent from a second company. Not any longer. AWeber has them both, a list of templets for your sign-up form and hundreds of templets for your email campaign. We’ll look at it all in my AWeber review. There are multiple ways to have a sign-up form on your site for an email marketing campaign. They can be placed anyplace on your pages and posts as a drop-in, slide-in’s, side widget. They have different template’s to use which you can change size, color, add text to and more. When your first starting out with your online business, you want to keep things simple. You have a lot of work to do on your site. You have content to write which is always being up-dated, comments to answer, new research to do on your niche, and more. So when your setting up an email campaign, you want to keep it simple but you want a program that is extreamly effective. Before I signed up to AWeber, I had gone to 2 other companies to get a sign-up form to place on my site. I already knew that AWeber was going to be my site for an email campaign, But was told by others I needed to sign up with “Thrive leads” or similar site that offers sign-up boxes for my site. Then tie that into my AWeber site to start my campaign. I did try, I bought the “Thrive leads” program, but I wasted a day trying to get the download into my site. Could not get an answer from support, so I wrote to the owner and told him to cancel and give me a refund. I went to AWeber and chatted with someone live and they told me they had the whole program with the sign-up forms. So its all done at the same site. It was new for me to take a site I had to the next level. I wasn’t sure what to expect and if it was going to be difficult or time consuming. So far it has been great. What do you get with AWeber? AWeber has excellent auto responder capabilities that provide on time, personalized messages for anyone that signs up on your site. Once you set them up with a welcome email, and then a set of timely emails to follow on your choice of days, your all set. With the email series, you have access to over 150 email templets to use so you can design your emails quickly. You can also integrate your email marketing with other business functions. You can easily add your sign-up form onto your Facebook page and other social media sites so your visitors there can sign up as well. It was so simple to get it all set up. I watched the quick start video and built my first list and 4 messages(emails) for that list in an hour and a half. AWeber runs regular live webinars with real time instructions from an AWeber expert. They also have step by step training video’s that take you from the sign up to creating your first campaign. I received training emails and tips on how to effectively get more sign-ups. After I had my emails done, I created a sign-up form which they make very easy with templets, changed some colors and added some text, copied the link and put it in a widget in my side bar that you see. Now that sign-up box is linked directly to my AWeber email campaign, Done. These are the “Basic” forms but there are different templets you can use. You can create different forms and attach them to different pages. Or put on in the page or post and one in a side widget, see which one works best. AWeber has a frequently asked questions section which is the most complete that I have seen on any site I visit. I usually have some odd but relevant questions when I am working with a new program. Every question I had, there was an answer for, that’s a new one for me. They have a list of reports that they provide. Not just on how many customers signed up, but how your sign-ups are interacting with your emails. You can see who opened the emails and if they clicked on any links you may have provided in that email. There is no limit to the amount of campaigns that you can run from one account. You can create a campaign for each site you have, or insert a different sign-up form to each page of your site, etc. 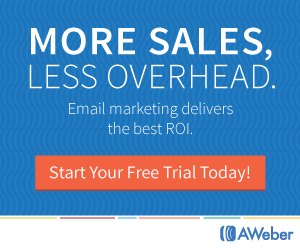 Amy said it all in that video, it is the best email marketing platform out there. I am using it and I would recommend it to anyone that wants to start an email campaign. When you consider the fact that when you post to social media, your add might stay visible to others for a few seconds to a few minutes. Other people posting that tag you, will replace your post at the top of your social page. Unless someone scrolls down your page, they will not see what you posted. You can create and schedule broadcast emails. Keep your subscribers engaged by regularly sending them emails. Broadcasts include weekly newsletters, event announcements, or updates about new promotions. An email capture form and your email campaign tied to that sign-up form is essential for your business to grow and be successful. You’ll be sending emails to people who asked to receive them. importance of having an email campaign. Great review. Im getting to the point now where I really ought to be thinking about email and email capture, and aweber is obviously the big name out there. I was a bit skeptical about the price but the service offered im sure is great. How do you compare it to GetResponse? I like their emiail funnel drag n drop option. I have had GetResponce in the past but in the last month or so of having it I was having trouble with the emails not getting sent in the times I had set up. I do like AWeber for the simplicity of using it. The temp lets they have for both the sign-up form and email response are great with many options. I have had no problems with the on time release of my emails and easily have done a few broadcast emails also. Its necessary today to have one of these programs for any online business. Choose the one that fits your needs. I’ve been looking into starting email marketing, but the problem is trying to find an autoresponder service because there are so many of them out there. However, I’ve heard a lot of great things on Aweber, and that’s worth taking for a test drive. I do like the fact that the first month costs nothing and it’s less than $20/month for 500 subscribers.I particularly like the sound of being able to create opt-in forms because it can save additional money in the long term. It is great to have the first month free which gives you the time to set it all up. Although very easy to do, as your starting a new website, it takes some time to get the visitors to your site and to start signing up. It has been a great program, many temp-lets to choose from for both the sign-up forma and the emails. I have been experimenting with different forms on different posts I have to see which one is working best. Also, they have no limit on the number of campaigns you can run from one account. I could not have read this article at a more perfect time! I have been wanting to set up an email campaign but wasn’t sure where to start! This system really sounds like something I can manage and handle! Thanks so much for sharing your experience with this company, I will have to add this to my to do list for next week! For myself, I wasn’t sure when to set this program up for my sites. I started it when I started to see some activity on my sites. I set up my sign-up form but didn’t install it till I had 4 emails ready to be sent. It’s a easy system to understand and they have plenty of training video’s. I have also used the support and not that I had any issues, but to find out how the response time was with a minor question. They were quick and clear. That is a fantastic article. I heard of aweber before when I attempted to set up a website in the past but I never got very far with it. I am definitely considering it again now since I have started this process again. I can’t wait to find out more information on it and work on implementing it on my site as well. Thank you. Congratulations on returning to the world of internet marketing. You have to keep going even when it seems dismal, your success will come. I would recommend that you sign up with them when you start to see some organic traffic. Set up your email auto-responders first, then create your sign-up form and add them to your site. One of the great things is you can have it slide in from the side at different times to whatever page is being viewed, or add it to a widget, etc. You can use different forms on different pages to see what works best. Its all up to you how you want to wok it. Your review of AWeber is great. As someone who has just got into affiliate marketing I will soon be looking for an email autoresponder. The review of AWeber is full of information. You used videos to introduce AWeber and followed them with more description of program benefits. Can you compare it to MailChimp for me? Mailchimp has a free starter program and everyone that sees that its free likes the idea and signs up. My problem is that the free program has caps on how many sign-ups (subscriptions) you can have and a cap on how many emails can be sent every month. The limits are good for a start up, but as soon as your list grows, you’ll have to move up to a paid program. The problem I had with Mailchimp is once you go into the paid programs, their prices are higher than the others out there such as AWeber and GetResponse. Its for that reason and also not wanting to move my whole email program to another server that I signed up with AWeber from the start. It would be such a hassle to move the whole thing once its running, so I was just planning ahead.